I made a surprise delivery today! Someone ordered a Sharp Crochet Hook that lives just a few blocks away from my home. How exciting!! After being persuaded from Sharp Crochet Hook facebook followers, I decided it would be fun to hand deliver the order! 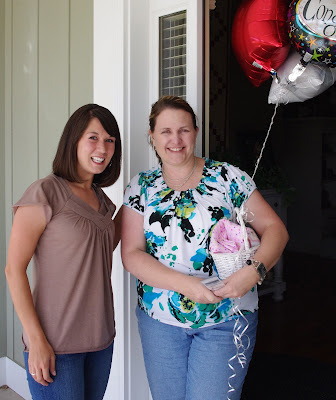 I topped off the occasion with a crochet edging gift basket and balloons. Thanks Terri for being so fun to surprise!And thank you to all of the Sharp Crochet Hook fans for convincing me that hand delivering an order would be cool, because it totally was! Man, I love my job!! What a fun way to surprise her! Great idea! What a fun surprise she got!